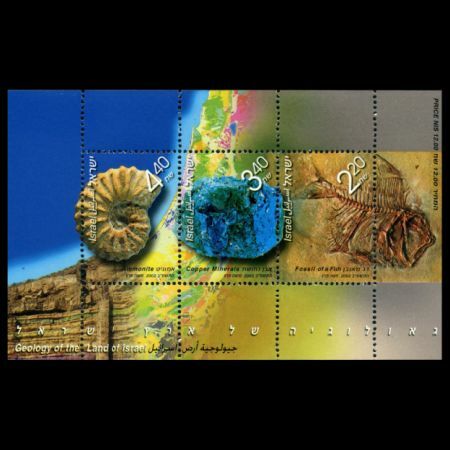 Israel 2002 "GEOLOGY OF THE LAND OF ISRAEL"
During ancient geological times, the land of Israel was situated on the northeastern margins of a continent comprising Africa and Arabia. An ocean named Tethys extended to the north, periodically inundating the region. Terrestrial sandstone, soil and marsh deposits accumulated on the exposed land of Israel. When the sea flooded the region, it deposited limestone and chalk with fossils, bearing evidence of the shallow to deep marine settings. As part of the global plate tectonic system, the Africa-Arabia continent moved northeastward and collided with the European-Asian continent. The resulting faulting and folding of the sedimentary strata in the land of Israel further intensified during the younger faulting event along the Dead Sea- Red Sea Rift Valley.These processes shaped the topography of the country and are still active as indicated by earthquakes in the region. Of particular morphological and geological interest is Makhtesh Ramon, the largest of the Negev erosion valleys cut into an upward-folded geological structure. These valleys are entirely surrounded by cliffs, comprising a single narrow outlet to the southeast, thus recalling a crater (mortar), called in Hebrew, Makhtesh.The elongated erosion valley of Makhtesh Ramon exposes ancient marine and terrestrial strata, intrusive magmatic and volcanic rocks and other remarkable geological phenomena.Makhtesh Ramon is thus a huge natural history museum, which became an official Geological Park under the initiative of Prof. Emmanuel Mazor of the Weizmann Institute of Science. The souvenir sheet illustrates samples from the collections of the Geological Survey of Israel and the Hebrew University, photographed by Dr. David Darom (Hebrew University).The geological map of Makhtesh Ramon area illustrates the first day cover.A reduced geological map of Israel is in the center of the souvenir sheet and a view of sedimentary layers in Nahal Ardon in east Makhtesh Ramon intruded by a vertical dyke, is on the left. The fossil fish, Aipichthyoides galeatus, is one of many vertebrate remains of great scientific significance, found in the country. The ammonite Proeucalycoceras haugi is a mollusk-conch fill of an extinct nature, related to extant octopods and squids.Ammonites are among the important fossils, defining geological periods. The blue green Elat Stone, frequently incorporated in Israeli jewelry, consists of some of the copper minerals mined in the Timna area (north of Elat) since about six centuries ago.The modern Timna mine was active between 1958 and 1976. 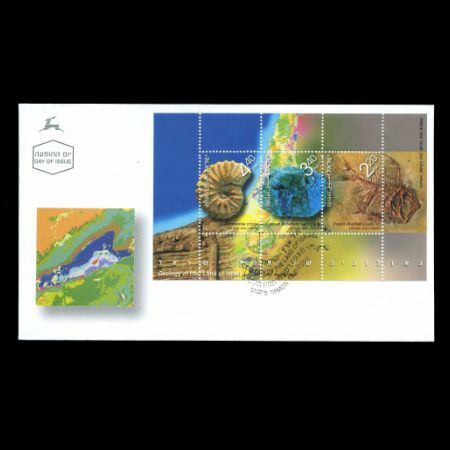 The souvenir sheet was prepared in collaboration with the Geological Survey of Israel, which is the governmental institution investigating the country's infrastructure, natural resources (including water) and evaluating geological and ecological hazards.